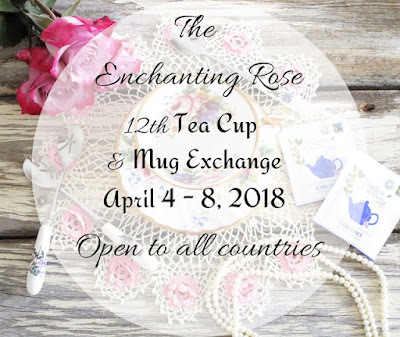 This is my third time to participate in the Tea Cup & Mug Exchange hosted by Stephanie over at The Enchanting Rose. It's not a swap where you send a package to someone and they send one back to you; in this exchange, you send a package to someone and then someone else sends a package to you so you make two new friends. My package came from Libby over at Artistic Expressions by Elisabeth. You can also check out her You Tube channel, absolutely, Elisabeth! Libby sent the best gift Vic and I could ask for - a tea set for two. Two cups and saucers along with two plates, a tea strainer, mini shortbread fingers, two packets of tea, and a lovely card. We can't wait to have Tea for Two. I have to mention also that Libby's gift was in a beautiful decorative box which has been put to work holding all of my scrapbook memorabilia for 2018. I think I've mentioned that I save just about everything from brochures to movie ticket stubs to postcards. Thank you, Libby, for the lovely package. My package went to a non-blogger, Jacqueline (Jackie), so here's a photo of the goodies she received in the mail. She sent me an email to say everything arrived safely and she was delighted with the contents. Her package included a package of Wild Blueberry Scones mix, tiny jars of lemon curd, clotted cream, strawberry jam, and orange marmalade, two types of herbal tea in tins, this month's TeaTime magazine, a crocheted doily, and a tea cup and saucer. Jackie said she is saving the goodies to have a tea with a good friend who will be visiting soon. 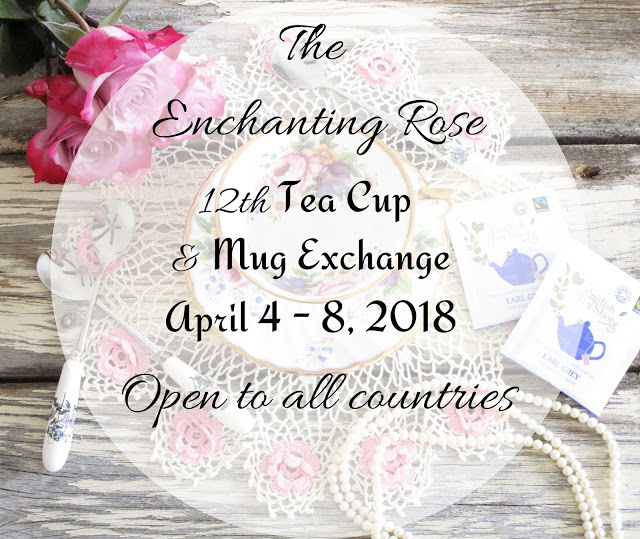 If you love tea, watch out for the next Tea Cup & Mug Exchange. The package you received and the one you sent were both wonderful. Isn't this the best exchange ever, and Stephanie the sweetest hostess? Enjoy all your teatime treasures. Oh Pamela, the tea cup you sent is stunning! My breath caught when I saw the last photo. I am sure Jacqueline was thrilled with her gifts. And oh, isn't Libby just a doll?! I love that she included TWO tea cups for you and your husband. Her package was truly delightful. Hugs to you! How precious that Libby would send two teacups for your enjoyment and they are so beautiful. The teacup you sent off is gorgeous and that lace doily placed on top of the magazine is stunning! What a special thing to send TWO - one for each you and your hubby to enjoy together. That was super sweet! I am so happy you joined in the fun. Isn't it a special thing? Steph works hard for us to have so much joy. I know I hope to never ever miss one. I see you live in VA and are in the Navy. I'm a Navy brat! My husband and I are USAF parents, living here in Hampton Roads and see the F22s taking off almost daily. I love how Libby sent you a package that you and your hubby can enjoy together!